Second, it’s a term that describes the evolving search—I’ll cover these two topics in a bit. Third—and where I aim to direct the conversation— berrypicking techniques are meant to inform the design of browsing. 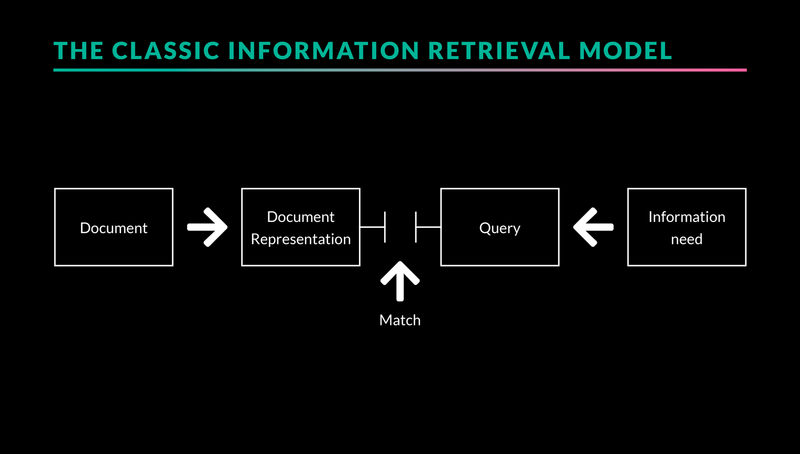 Let’s review the classic information retrieval model. This model was presented in 1977 and has informed so many studies (Robertson, 1977). It tells us that a document, which is essentially information, is represented in many ways: Articles, Journals, books, notes, recordings, and so on. Anyway, this model says that when someone has an information need, they can make a query search. And voila! Ideally, there is a match. The classic information retrieval model from Robertson’s Theories and Models in Information Retrieval (1977). Since then, that model has gained more critics. As you would have it, the proposal is that researchers take a path called “the evolving search”. Marcia J. Bates says that researchers are involved in different actions at different times throughout the search process. 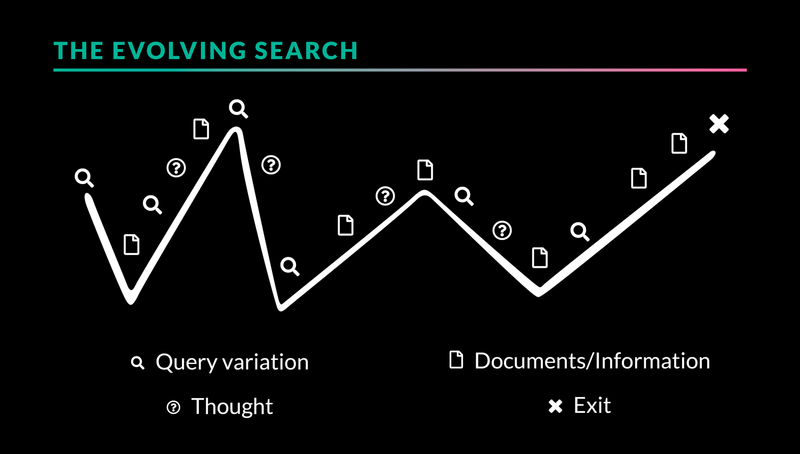 In this case, you can see that the model proposes that the user may begin the search with a query, they gain a document, there’s a new query, a new thought is formed, a new document is gained, and so on until the researcher ends, or “exits,” their search. Here you see that the search is bound by the interest in the topic or subject. I think these parameters are set by the depth that you want to go in your research. Or maybe how far you want to take the scope of your search. And so the evolving search that takes place in the Universe of interest is bound by the parameters of the available knowledge. This is the universe of knowledge. Marcia presents those parameters in such a strict fashion. But I have a sneaking suspicion that that is not the case. 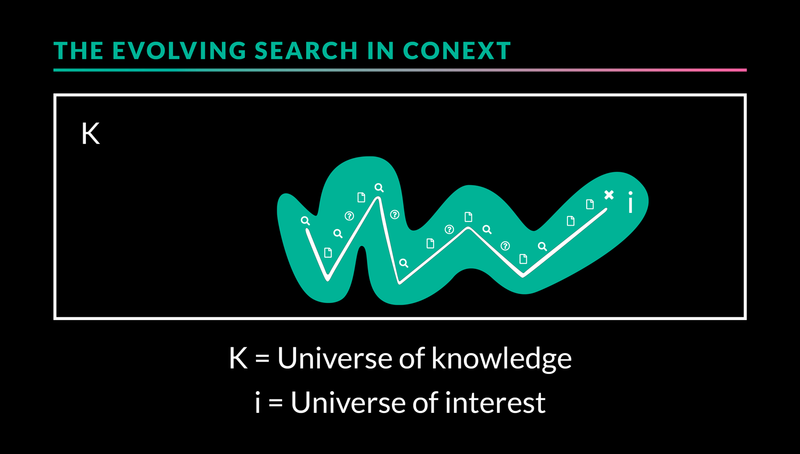 Those bounds and arena of the universe of knowledge probably look something more like the universe of interest. But back to this a-bit-at-a-time search. What does it mean for designers? More specifically, what does it mean for those designers of browsing experiences and search interfaces? I wanted to note berrypicking techniques that are available in the context outside of the academic or scientific research domain. Here is one example in the wild—on Instagram. You can see in the four screens that are very similar. At the search bar, you can see that I searched “berry”. Instagram allows me to “filter” between “Top” search results, “People” results, “Tags” Results, and “Places” results. In the 5th screen, you can see that I have not searched for anything. I have only switched over to the Explore section and already Instagram poses different avenues of interest. Here’s the google search. 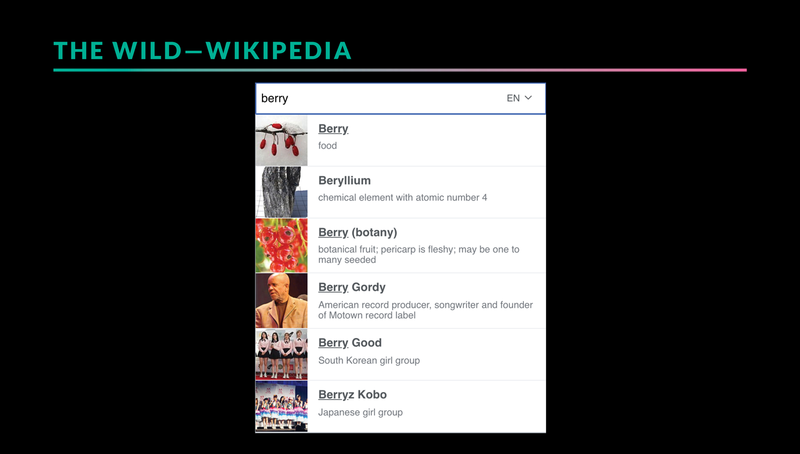 I’m not sure how far out Google is expanding my universe of interest relative to the topic of “berry”. And, I really wonder how Google views its search users. Here are the berrypicking techniques evident in the search for “berry” on Wikipedia. The results are broken down into a type of food, a type of botanical fruit, and other categories like music, I think this is far out in regards to the universe of interest that Wikipedia has set up for me. And back to the context that Marcia Bates explores in the paper. 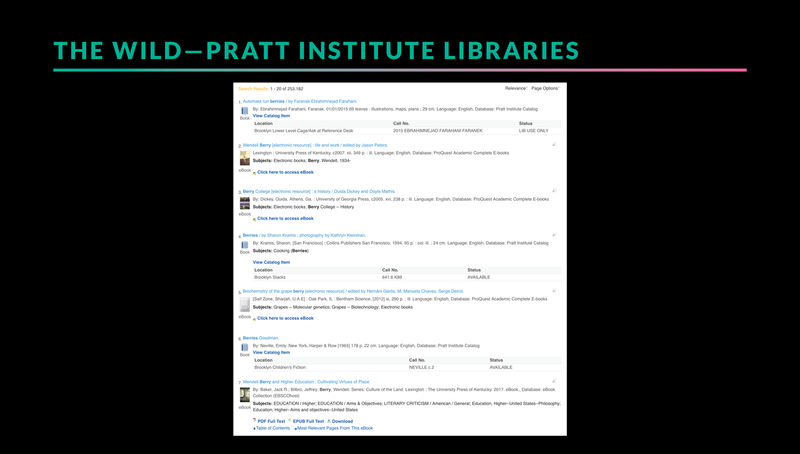 Here are the search results for “berry” on the Pratt Institute Libraries quick search. Initially, it has given me seven ebooks and books. The eighth result is an academic journal…finally, but that is way below the fold. Bates, M. J. (1986). An exploratory paradigm for online information retrieval.  Intelligent Information Systems for the Information Society. Amsterdam: North-Holland, 91–99. Bates, M. J. (1986). Subject access in online catalogs: A design model. Journal of the American society for information science, 37(6), 357–376. Bates, M. J. (1989). 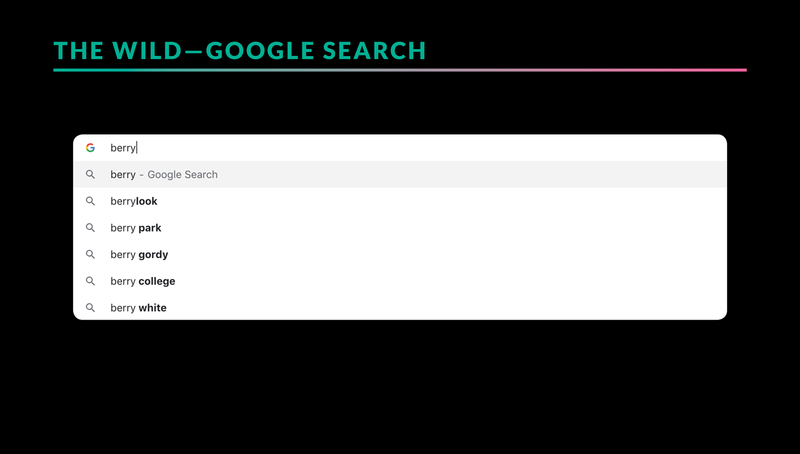 The design of browsing and berrypicking techniques for the online search interface. Online review, 13(5), 407–424. Ellis, D. (1984). The effectiveness of information retrieval systems: The need for improved explanatory frameworks. Social science information studies, 4(4), 261–272. Ellis, D. (1984). Theory and explanation in information retrieval research. Journal of Information Science, 8(1), 25–38. Oddy, R. N. (1977). Information retrieval through man-machine dialogue. Journal of documentation, 33(1), 1–14. Robertson, S. E. (1977). Theories and models in information retrieval. Journal of documentation, 33(2), 126–148. In short, Peter Knocke positions himself as a UX Director and Digital Strategy Consultant. He continuously works with a variety of organizations, ranging from small start-up groups to larger, multi-brand companies. The main selling points that he stresses in his description are that he provides product and business strategy and collaborates with many teams to build and refine digital products. Peter Knocke completed his initial studies in Business Management with Entrepreneurial specialization at the University of Central Florida. Along the way, Knocke exercised his skills managing systems traffic analysis and research teams. When he recalls how he first became involved in interaction design, Knocke refers to becoming interested in the specific role that design plays in the functionality of products. This interest grew into a plan that led him to Milan, Italy to fulfill the Interaction Design Master’s program at Domus Academy. Following this, he primarily worked at consulting agencies aligned with business clients. Eventually, Knocke admits to gaining enough confidence to go independent. At this point he stresses that, to be successful in this arena, he has to maintain several aspects: A critical perspective, a professional outlook, an adaptable skillset, and transparency in the services he provides. As you delve a bit deeper into Knocke’s professional life, you get to recognize that his services mix modern UX and traditional UI roles, and span across a blend of product management and product strategy. While it matters largely on the clients’ or organizations’ needs, Knocke’s engagement involves having input into the direction of many teams. He highlights that he must always maintain a good grasp on the road map for whatever product or strategy he may be helping to build and develop. If his client or the company gets off track, it’s his duty to redefine the structures and set them on the right path. As part of his mission, Knocke is invested in setting up a design system for his clients. His focus is to give companies the toolsets and define the best patterns to sustain internal departments and public-facing products. 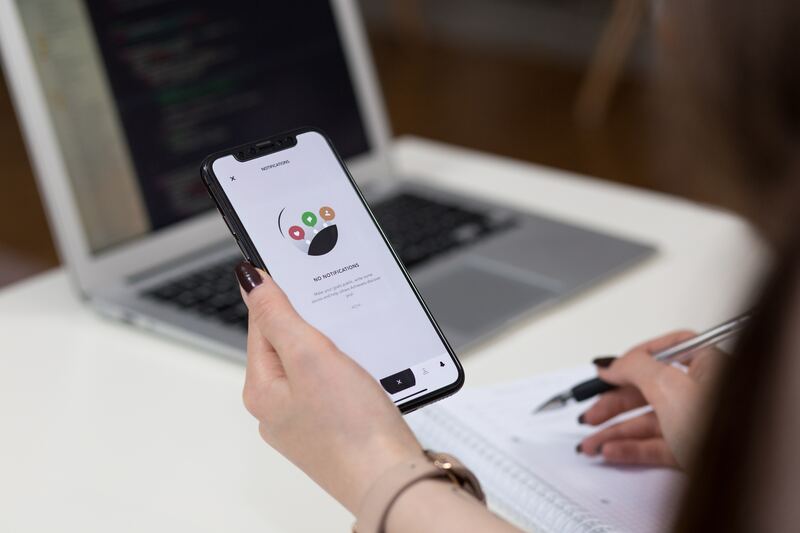 Design projects vary from the likes of translating a website into an application, transposing old applications and breathing new life into them, to working with back-end developers to build a new product. His special blend of director–consultant can mean he is involved with UX teams and web developers, while at the same time maintaining the business goals in perspective. And though he advocates for adaptability in any career involving any type of skillset, he does emphasize that designers should draw the line at defining their specialty. When asked what software tools he prefers to use, he mentions Sketch, InVision, Principle and rounds off the list with an experienced and resounding,“The tools always change.” Knocke also stresses the importance of lo-fi sketching and wire framing. To add to this, he emphasizes that the organization of content is more important than visual style. And to sum it all up, he reminds me that the design process is a cycle. Analysis is inevitable at every phase, which also gives way to chances for refinement. UX is about striving to understand. Try everything, develop your own natural interests, stay figuring things out, do small projects, and, most importantly, don’t worry. Don’t worry that you have to know everything and don’t think that you have to be able to do everything. Companies and clients are looking for excitement, natural interest and someone who shows a a passion for figuring things out. Peter Knocke is also a teacher. He helped to develop Huge UX School—an agency-backed internship intended to, not only satisfy the demand for UX designers, but to give those in the working industry a practical approach and entry into user experience design—and spent time teaching at General Assembly. Naturally, in his last piece of advice he mentions that if you want to learn something, try your hand at teaching it. Square Cash, known simply as Cash on iPhone iOS, is a service that allows US debit card users to send and receive payments in US dollars. Users do not necessarily create an account with a username. Instead, new users are prompted to enter their existing debit card information and email address. Cash will pull debits from and push credits to the bank account tied to the debit card. Users also have the option to personalize a Cash Card—you can use your Cash Card like an ATM/debit card—and now you can buy and sell Bitcoin. Cash successfully toggles between the visceral and behavioral levels of a user. Signifiers, like arrows and ‘x’ marks, lead the way and act as breadcrumbs to easily map your way. Equally, confirmation screens double-up on reassuring users of their decisions. Even sensibility checks in the form of pop ups that block secure information come through as you traverse the application and move between screens. A sea of green: The load screen with the logo is your initial signifier, then the home screen populates sans hamburger menu. Although a clear map is not initially apparent, Cash gives feedback from the minute it loads the home screen. Users have immediate access to typing in numbers in a calculator keyboard. Buttons sit in the footer and other screens are accessible at the top. That’s it. There is no menu tucked away in a hamburger icon. It’s as if there’s nothing to hide. The home screen really allows users to easily fill in the conceptual model of the software by applying a personal user model and map. Cash is so cool, it even allows you to draft your balance and deposit into your bank account immediately! Amazing. In going from a visceral to a behavioral level, the software provides a seamless transition by applying a cultural constraint then applying a semantic constraint. Visually, there are no cues of this transition, unless you count the open screen lag before the calculator screen populates. Immediately, users can jump from their perception of what they are about to do, to specifying and interpreting those actions into a real-life transaction. Unlike applications like Venmo, Cash does not require you to create a profile attached to a username. There is no news or social feed where friends gather to divulge. It’s your profile, you can do what you want to with it. Nobody cares, because no one is looking at it. The absence of a social media feed can alleviate the anxiety that some people face in sharing their information on-line. Going without a social feed, in this instance, does not render the application less relevant. 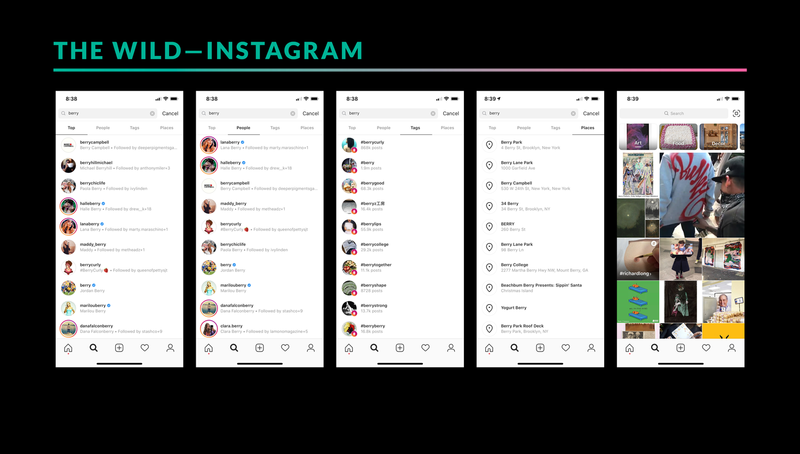 While a social feed is an attribute that can result in positive psychological feedback for some users—that results in them coming back to use the app more often than other users—it can also be a disadvantage to another base of users. In fact, going without a social media feed that publishes your activity and exchange of money can help to alleviate and diminish the phenomenon of learned helplessness. Users don’t have to worry about publicly announcing their monetary exchanges. While the product already involves a form of mathematics, a phobia of some, the task at hand is clear, and users do not have to spend time and attention on other aspects that exacerbate phobias about using online software and publicly sharing information. I believe this particularly important decision is an exercise of a favorable, cultural constraint to impose on users. Specifically, as a US consumer, I am not too keen on publicly sharing my purchases and other transactions that have a price tag assigned to them. Intuitively, I am able to use the app for two, sensitive instances: send and/or receive money. I don’t have to think about any other behavior. Thus, cultural constraints and conventions are satisfied, and I can focus on the flow and features of the software. Visually, the semantic constraints to only feature the amount paid or received, time-stamp and the name of the recipient or sender, makes all the info easy to digest. Users can process information quickly and effectively, so that we can discern between being paid, sending money, or cashing out. In this case, Cash decides that adding a description note is secondary information, unless you are the sender and remember to input a description before you send the money. On the other hand, it also adds an extra step, in attempting to determine, for example, when and why cashed out. From left to right: the second screen shows your activity, but it isn’t very descriptive. Instead of users having to populate another screen, perhaps an option that shows a small description of the transaction would eliminate this step. See the farthest right screen for an example of what a one-liner descriptor would look like. I suggest that Cash app incorporate a short descriptor in the activity feed, so that users avoid the additional step to secure that information. A simple application can become overwhelming when more screens are added to our mental mapping of the UI. Adding the suggested descriptor line to the activity feed will diminish the need to populate another screen. Users can jump into the window that displays each transaction details separately on their own accordance. This not only alleviates extra steps, but it also creates a simpler map for users who are not invested in the details. Overall, the strategies that Cash uses in their interface fulfills the seven stages of action. As mentioned in the recommendations, allowing for alternative sequences can give the user more flexibility in their actions when moving between screens. Allotting control, where designers may have not given the user enough, can alleviate some of the frustration that comes with having a broad range of users.